At FastFig, we're very proud and honored to be a DreamIt company. When we were accepted, we were very excited to be part of such a great network, to have access to people with incredible experience, and to move to Austin with nothing to do but work on our business full-time. It's like a lean startup wish come true. Of course, then we got to Texas and realized we had an empty apartment. And there is nothing a group of entrepreneurs (particularly engineering-inclined ones) likes more than the prospect of getting to fill empty space with DIY projects. Step one for us was pretty simple: Whiteboard. Con: A 3' x 4' sheet is $136. Pro: It gets four stars! Definitively not lean. 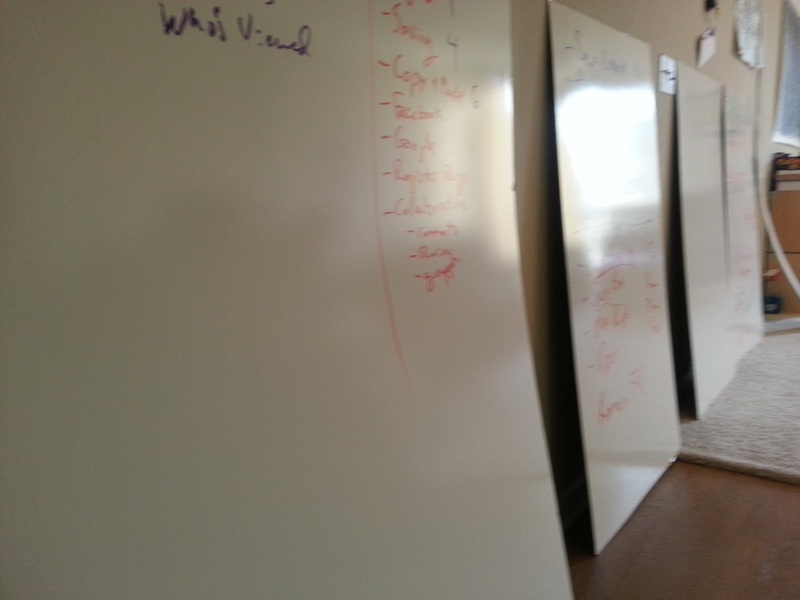 Plus, we're a tech startup; we need LOTS of whiteboard. That would end up being our pizza budget for most of 2013. Fortunately, our local enormous big box hardware store was less than a mile away. 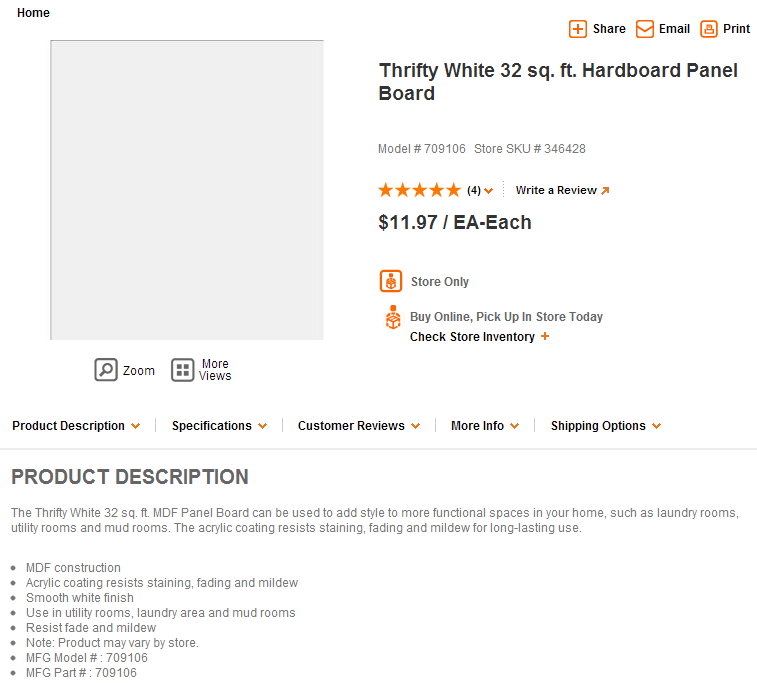 And there, they sell something called panel board. Panel board, for all intents and purposes, is a dry-erase surface stuck on top of something between particle board and really sturdy carboard. And a 4' x 8' sheet costs about $12. 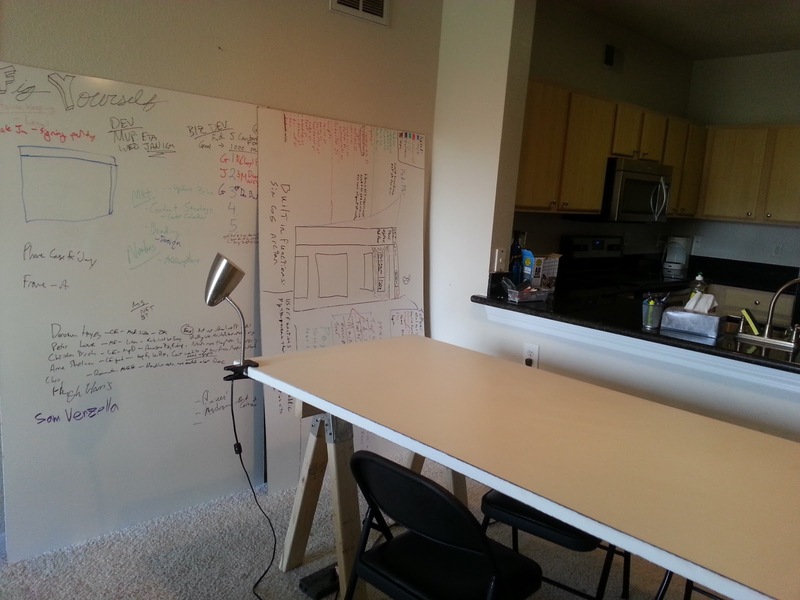 So that's around 100 square feet of whiteboard for $36. Pros: Gets five stars (! 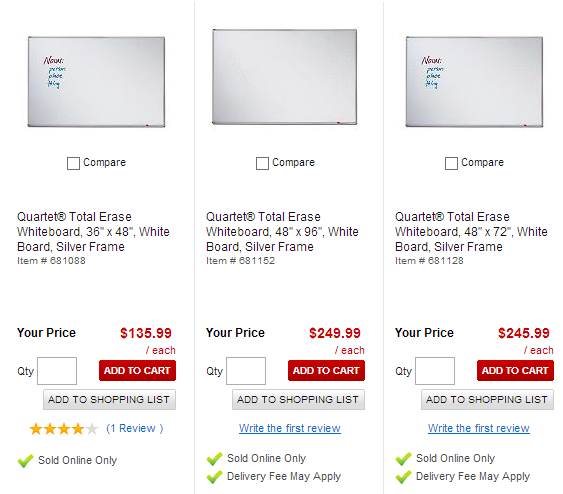 ), is awesome dry-erase surface, is dirt cheap. Con: Must be cut to fit in a Subaru. Protip: Measure your car's cargo space before buying and carting the panel board out to the parking lot. Fortunately, the fine folk at your large home retailer will cut the boards for you for free, but it's better to know the dimensions going in. Getting a bunch of different sizes was actually something we found to be useful. If you've got a truck, just make sure the stuff is secure before you peel out of the parking lot in your haste to sketch site architecture. Now, if you're in a place where you will be for a long time, you can buy some cheap strips of wood or metal and create frames and mount them. We're only in this space for three months, though, and we like to be able to move stuff around, so it basically became slideable wallpaper. We really wish we'd done this in college. That table is perfect for laying a big piece flat so we can all stand around it and diagram. Right now we're working at the Capital Factory, and the lean life dictates it may be some time before we have our own office space. But this can work anywhere your team is, be in home or office. Honestly, this is valuable thing for anyone who's going to do some work at home, whether it be a startup team, consultant or engineering student. It became an instant hit at our inaugural DreamIt house party. The one investment you'll want to make is Windex and paper towels; for some reason, dry-erase erasers have a tendency to leave streaks on panel board. If you do wind up with weirdly sized small pieces of panel board, you can lay them flat on the table and take notes as you work. Love this post! What you're up to sounds awesome and I am cheering you on. I am also a big fan of whiteboards, and installed one in my home office for whenever I need to "think big." Had I shopped around like you guys I could have saved some $!